Eve Muirhead says Scotland are in good shape to challenge for honours at the European Curling Championships. 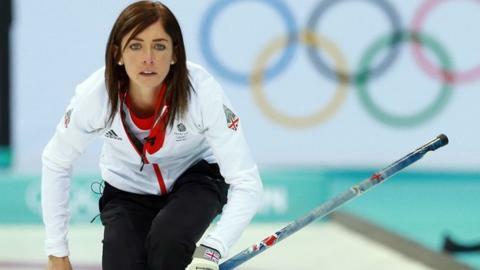 Her rink line-up changed after winning Winter Olympic bronze for Great Britain in Sochi, with former nurse Sarah Reid replacing lead Claire Hamilton. "We've had a solid start to the season and Sarah's fitted in really well," skip Muirhead told BBC Sport. "It's a work in progress but we're still one of the best teams around and our chances in Switzerland are good." After the frenzy of attention following their Winter Olympics success, Muirhead feels the team is now suitably focussed. "It's huge what winning an Olympic medal does to you," said Muirhead. "It was like a whirlwind afterwards and it does change your life in a lot of different ways. "But now we're back to normal and a lot of training. "We can't take our foot off the gas - if we perform the way we did last year it won't be good enough this year. Muirhead is upbeat about Scotland's hopes. "We need to stay ahead of other countries." The European Championships in the Swiss town of Champery run from 22 to 29 November. Last year, Muirhead's Scotland were undefeated on their way to the final, but were beaten to the gold by Sweden. Despite having a new younger line-up, the Swedes will still represent tough competition for the Scots. Hosts Switzerland, who took bronze 12 months ago, will also be strong despite the fact their experienced skip Mirjam Ott has retired. "We're going to have to be at the top of our game; you can't write off any nation," said Muirhead. "We plan our calendar around these events so it's a case of getting out there and seeing it through." The men's rink representing Scotland will be skipped by David Edwards, after his quartet beat Olympic silver medallist David Murdoch at the Scottish national 'playdowns' in October. Under Murdoch, the Scottish men took bronze in Stavanger last time round, while Switzerland are the defending champions having beaten Norway in the final. There is other home nations interest at the event, with England entering men's and women's rinks in the B Division, where the Welsh men also have representation.